Ornamental koi and goldfish ponds come in an assortment of shapes, sizes, depths and degrees of complexity. They can be small and simple, such as the hard-plastic, pre-formed molds available at large home improvement stores, or they can be large, fancy natural bodies of water. Either way, they are always fun to watch and relatively easy to maintain. Ponds come in a variety of sizes and types. Some ponds are created when a hole is dug out on a piece of property to make a foundation for the home. The hole is filled with water, maintained with rainwater and becomes home to all manner of wildlife. Some are naturally occurring ponds built by Mother Nature and left to fill naturally with water, flora and fauna. Others are small, man-made ponds created by sinking a hard molded plastic shell into a dug-out hole, equipped with a filter and fountain and carefully tended to with chemicals to maintain the right balance of pH, nitrites, nitrates and chlorine. All these ponds can be pressed into service as a home for koi, goldfish and other species of small, amphibious critters. 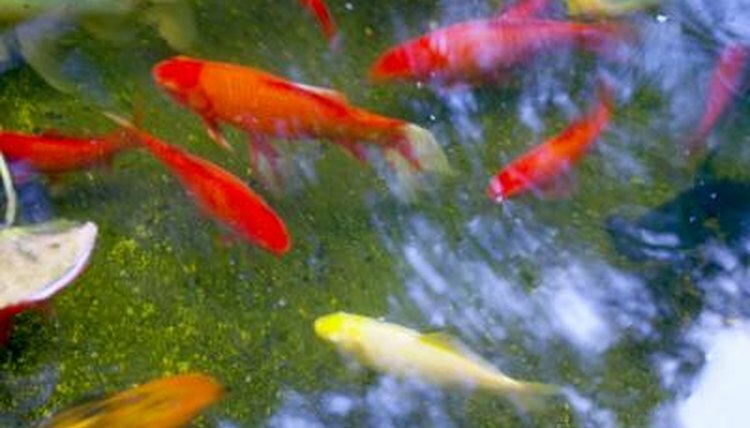 Koi and goldfish are closely related. They are both members of the carp family with origins in China more than 2,000 years ago. They have the same dietary and environmental needs and are both easy to care for as long as the water in which they live is maintained within a healthy balance of pH and chemicals, kept clean and clear and the algae strictly controlled. There are a number of products available, both chemical and biological, that can help you keep your pond, and the fish that make it their home, a safe and happy place. When stocking your pond for the first time, choose small, juvenile fish since they are far less expensive than full-grown koi. Feed them a high-quality pond fish diet and equip the pond with an efficient filter. Since ponds vary vastly in size, shape, type and depth, it's impossible to come up with a "one size fits all" rule for them, but basically, as long as you keep the natural balances of elements in check by testing the water regularly with test strips and adding chemicals as necessary, you will be able to keep your pond and fish in good health. If you live in an area with wide temperature extremes, such as cold, harsh winters and warm, humid summers, the pond should be very deep so the fish can dive deep to escape colder water and shaded to afford respite from the hot sun. Shading will also keep direct sun off the pond, which is an important strategy in avoiding algae, which can ruin your pond and kill your fish. Your supplies should include a net for pulling debris or dead fish from the pond and pond decor that affords the fish places to hide. Real plants provide oxygen and keep the pond free of bacteria while helping to fight algae blooms. Provide a stone or gradient for a hapless frog or mouse to use to find its way out if it falls in the water. Use goldfish flakes for smaller fish, and pellets as they grow larger. Invest in a good pond filter, and change the filter and charcoal every three to four months. Add algaecides as necessary to avoid algae or to kill existing algae blooms. If the pond is in proximity of sprinklers that use city water, check the levels of chlorine, nitrites and nitrates in the water on a weekly basis. The presence of a functioning fountain and natural evaporation, however, usually keep chlorine levels in check. Adding a few algae-eaters, two or three for every 10 gallons, will also help keep algae under control. What Type of Gravel Is Good for a Koi Pond? Can Baby Koi & Adult Goldfish Live Together?